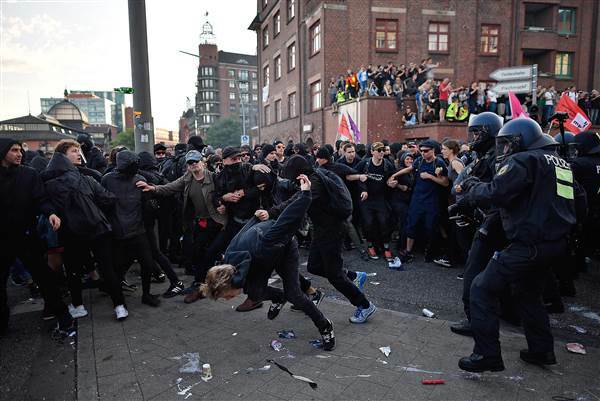 Dozens of police were injured in clashes with protesters before a G20 summit in Hamburg on Thursday, reports Reuters. Nearly 75 police officers were injured throughout the evening, with three requiring treatment in hospital, police said. The pilots of a police helicopter sustained eye injuries when laser pointers were directed at them, police said. Protesters damaged cars, set other objects ablaze and threw bottles in roving clashes that lasted until midnight. 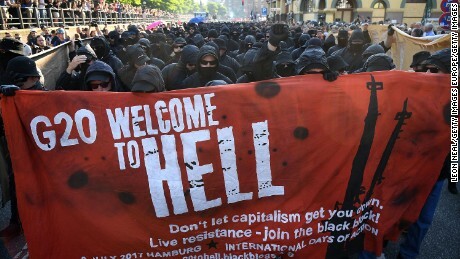 "Welcome to Hell" was the protesters' greeting for President Trump and other world leaders arriving for the two-day meeting. According to Reuters, police expected around 100,000 protesters in the port city, some 8,000 of whom are deemed by security forces to be ready to commit violence. At least 13,000 protesters joined the main march on Thursday, including around 1,000 black-clad and masked anarchists, police said. Up to 20,000 police officers from across Germany are on hand. Protesters clearly weren't identifying the subtleties between free market capitalism and crony capitalism. Capitalism will end... Marx said so! Karl be praised! Ugh. What I want to know is when will socialismercantilisocialisimercatilism end? “Free-market capitalism is a network of free and voluntary exchanges in which producers work, produce, and exchange their products for the products of others through prices voluntarily arrived at. Central banking is not a viable capitalism. It is inherently corrupt. 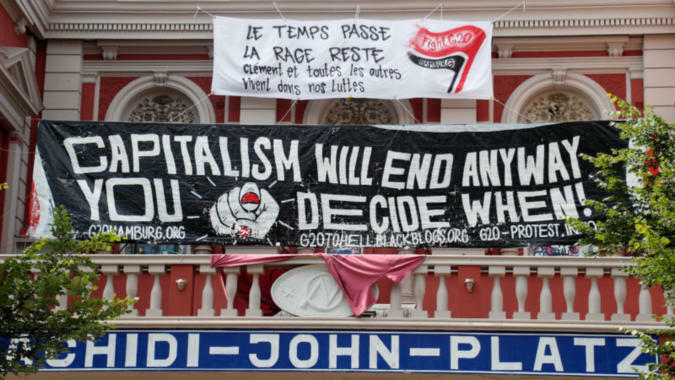 "Nothing says "Down with Capitalism!" quite like getting arrested in your Calvin Klein undies Nike shoes"
This is not a good argument. It's the same criticism that anarchists get when they use public roads. Like there's a choice given the current circumstances. No, the protester does have options. There are plenty of options beyond US brand name underwear and athletic shoes. It is not the same as anarchists forced to use public roads. BIG DIFFERENCE.